This protocol describes in detail the generation of footprint-free induced pluripotent stem cells (iPSCs) from human pancreatic cells in feeder-free conditions, followed by editing using CRISPR/Cas9 ribonucleoproteins and characterization of the modified single-cell clones. Nandal, A., Mallon, B., Telugu, B. P. Efficient Generation and Editing of Feeder-free IPSCs from Human Pancreatic Cells Using the CRISPR-Cas9 System. J. Vis. Exp. (129), e56260, doi:10.3791/56260 (2017). Embryonic and induced pluripotent stem cells can self-renew and differentiate into multiple cell types of the body. The pluripotent cells are thus coveted for research in regenerative medicine and are currently in clinical trials for eye diseases, diabetes, heart diseases, and other disorders. The potential to differentiate into specialized cell types coupled with the recent advances in genome editing technologies including the CRISPR/Cas system have provided additional opportunities for tailoring the genome of iPSC for varied applications including disease modeling, gene therapy, and biasing pathways of differentiation, to name a few. Among the available editing technologies, the CRISPR/Cas9 from Streptococcus pyogenes has emerged as a tool of choice for site-specific editing of the eukaryotic genome. The CRISPRs are easily accessible, inexpensive, and highly efficient in engineering targeted edits. The system requires a Cas9 nuclease and a guide sequence (20-mer) specific to the genomic target abutting a 3-nucleotide "NGG" protospacer-adjacent-motif (PAM) for targeting Cas9 to the desired genomic locus, alongside a universal Cas9 binding tracer RNA (together called single guide RNA or sgRNA). Here we present a step-by-step protocol for efficient generation of feeder-independent and footprint-free iPSC and describe methodologies for genome editing of iPSC using the Cas9 ribonucleoprotein (RNP) complexes. The genome editing protocol is effective and can be easily multiplexed by pre-complexing sgRNAs for more than one target with the Cas9 protein and simultaneously delivering into the cells. Finally, we describe a simplified approach for identification and characterization of iPSCs with desired edits. Taken together, the outlined strategies are expected to streamline generation and editing of iPSC for manifold applications. The reprogramming of human somatic cells to the pluripotent state by overexpression of reprogramming factors has revolutionized stem cell research with applications in disease modeling, regenerative medicine, and drug development. Several non-viral reprogramming methods are available for delivery of reprogramming factors and generating iPSCs, but the process is labor intensive and not very efficient1. The viral methods, though efficient, are associated with problems of virus integration and tumorigenicity2,3,4. In this manuscript, we report the use of cytoplasmic Sendai virus for delivering reprogramming factors and establishing footprint-free iPSC lines that lack integration of any viral vector sequences into their genomes5. Sendai virus is an RNA virus that is diluted out of cell cytoplasm ~10 passages after infection and produces reprogramming factors in abundance, leading to rapid and efficient reprogramming6,7. The established iPSCs can then be readily transitioned to feeder-free medium to avoid the use of mouse embryonic fibroblasts (MEFs) as feeder cells8. In this publication, in addition to outlining the Sendai virus mediated reprogramming, we also describe an improved protocol for editing iPSCs, which has the potential to supply unlimited human cells with desired genetic modifications for research. We have used CRISPR/Cas9 technology for the modification of iPSCs, which is now being used for a wide range of applications including knock-ins and knockouts, large-scale genomic deletions, pooled library screening for gene discovery, genetic engineering of numerous model organisms, and gene therapy9,10,11. This technique involves the formation of complexes of Streptococcus pyogenes-derived Cas9 nuclease and 20-mer guide RNAs that achieve target recognition via base-pairing with genomic target sequence adjacent to 3' nucleotide protospacer adjacent motif (PAM) sequence. The Cas9 nuclease induces a double stranded break ~3 nucleotides from the PAM site, which is subsequently repaired predominantly by non-homologous end joining (NHEJ) pathway leading to insertions or deletions in the open reading frame, and thereby functional knockout of genes12. Our improved protocol includes the details for culture of human pancreatic cells, their reprogramming on mitotically inactivated mouse embryonic fibroblasts (MEFs) to achieve higher efficiency of reprogramming, subsequent adaptation to feeder-free culture on Matrigel, characterization of established iPSCs, CRISPR guided RNA design and preparation, delivery into iPSCs as RNP complexes, single cell sorting to generate clonal lines of edited iPSCs, easy screening and identification of edits, and characterization of single cell clones. Genomic deletions were efficiently generated in this study by the introduction of Cas9 protein and two CRISPR sgRNA RNP complexes to induce double stranded breaks (DSBs) and deletion of the intervening segment. This method capitalizes on the use of two guides for generating deletions in the open reading frame, high efficiency of NHEJ leading to low number of clones that need to be characterized, and easy preliminary screening of clones by the automated capillary electrophoresis unit, fragment analyzer. These effective genome editing methods to generate human stem cell-based disease models will soon become a standard and routine approach in any stem cell laboratory. Finally, precise genome editing will make it possible to go beyond stem cell disease modeling and potentially could help catalyze cell-based therapies. Coat a 6-well plate with 1.5 mg/mL cold collagen and allow it to gel at 37 °C for 1 h.
Plate early passage human primary pancreatic cells in Prigrow III medium (~1 - 1.5 × 105 cells) on a collagen coated 6-well plate on day -2 to achieve approximately 2.5 × 105 cells or at least 60% confluency per well on the day of transduction (day 0). For the first study, plate at least 2 - 3 wells to get one well with desired confluency on day 0. Use at least one well as a control to count the cells. On the day of transduction (day 0), warm 1 mL of Prigrow III medium in a water bath for each well to be transduced. Harvest the cells from one control well in 1 mL of 10% FBS medium using 1 mL of trypsin/EDTA for 5 min or till the cells detach to perform a cell count. To make 10% FBS medium, add DMEM, 10% FBS, 1% L-Glutamine, 1% Sodium Pyruvate and 1% non-essential amino acids. Count and check the viability of the cells using the cell counter and calculate the volume of each virus needed to reach the target based on the cell number and virus titer. Use multiplicity of infection (MOI) of KOS = 5, hc-Myc = 5 and hKlf4 = 3 for the pancreatic cells. Thaw one set of Sendai vector tubes in the -80 °C storage on ice and carefully add the calculated volumes of each of the three Sendai vector tubes to 1 mL of Prigrow III medium, pre-warmed to 37 °C. Pipette gently to mix the solution. One well in a 6-well plate is enough for transducing with Sendai viral vectors to generate reprogrammed cells. Aspirate the Prigrow III medium from the cells, and slowly add the reprogramming virus mixture to the wells containing the cells. Incubate the cells overnight in a 37 °C incubator with a humidified atmosphere of 5% CO2. Carefully discard the virus mixture on cells and replace with fresh Prigrow III medium the next day, 24 h after transduction. Culture the cells for 5 d and change the medium every alternate day. On day 5, prepare MEFs on 0.1% gelatin pre-coated 10 cm culture dishes (1.3 x106 cells/dish). Grow MEFs in T175 flasks till day 4 and then on day 5, expose the cells to 6,000 rads from a γ-radiation source before seeding the cells13 or use the commercial MEF source. On day 6, use 1 mL of cell detachment solution for 10 min to detach the transduced cells, plate all of them on MEF dishes in Prigrow III medium with rock inhibitor (5 mM stock, 10 µM final) and incubate overnight in a 37 °C incubator with a humidified atmosphere of 5% CO2. Change the Prigrow III medium to hESC medium the next day. For making 500 mL of hESC medium, add DMEM/F-12, 20% (v/v) knockout serum replacement (KOSR), 5 ng/mL bFGF; 1 mM l-glutamine; 100 µM nonessential amino acids and 100 µM 2-mercaptoethanol. Change the medium gently every day now. Observe the plates regularly for the emergence of cell clumps or colonies indicative of reprogrammed cells. The transformed cells form clonal aggregates with cobblestone morphology and big nucleus and nucleoli. Mark the probable 'iPSC' colonies and check them regularly for growth. Almost four weeks after transduction as colonies are ready for picking or transfer, prepare 24-well MEF plates by plating 1.3 x 106 cells/gelatin pre-coated plate as before for the transfer of single colonies. Prepare matrix membrane (e.g., Matrigel) by aliquoting it based on the dilution factor on the certificate of analysis. Add one aliquot to 25 mL of DMEM/F-12 to coat four 6-well plates (1 mL/well) and incubate at room temperature (RT) for at least 1 h before use. Manually pick 12-24 colonies by using a sterile pipette-tip to aspirate them and transfer onto MEF plates in 500 µL of hESC medium. Aspirate the media in the well to gently disrupt or break apart the colonies. Also pick 24-48 colonies on matrix membrane coated 24-well plates. For the membrane coated plates, use mTeSR1 (supplemented with 10 µM rock inhibitor) for 24 h and change every day. Within 6-10 d of picking colonies, they are ready to be transferred to the new 24-well and/or 12-well membrane plates for clonal expansion. If needed, detach the colonies on MEFs using 1 mg/mL collagenase for 20 min, wash twice with hESC/mTeSR1 and transfer to membrane coated 12- or 24-well plates. If there are enough robust colonies growing on the matrix membrane from step 1.1.12, freeze the colonies on MEFs using iPSC freezing media as per the manufacturer's guidelines. Detach the robust colonies plated on the membrane in step 1.1.12 using 500 µL of dispase for 20 min and plate again on matrix membrane coated 12-well plates. Manually scrape off any differentiated cells or contaminating MEF feeder cells to enrich for pluripotent clones on the membrane. Expand the clones after 6-8 d by growing on membrane coated plates by dissociating with dispase solution as before and plating small cell aggregates on fresh membrane coated 6- or 12-well plate. Change mTeSR1 medium daily. Characterize the reprogrammed clones by alkaline phosphatase staining, immunostaining for pluripotency markers (OCT3/4 and NANOG), FACS analysis of pluripotent surface markers and differentiation assays. Grow and culture the clones on membrane-coated plates for all the assays including CRISPR editing as explained above unless other coating solution is specifically mentioned. NOTE: A commercial kit is used here. See the Materials Table. Plate putative human iPSCs on 24-well plate and culture for 4-5 d with daily media change. To start the staining protocol, aspirate the culture medium and wash the cells with 1 mL of 1x PBS with 0.05% Tween 20 (PBST). Add 0.5 mL of fix solution in the kit on the cells and incubate at RT for 2 to 5 min. Aspirate the fix solution and then wash the fixed cells with PBST. Do not allow the wells to dry. Add 0.5 mL of freshly prepared AP Substrate Solution per well by mixing solution A, B and C. Incubate the cells in the dark (wrapped with foil or in a dark container) at room temperature for 5 to 15 min. NOTE: Closely monitor the color change and stop the reaction when the color turns bright to avoid non-specific staining. Stop the reaction by aspirating the AP Substrate Solution and washing the wells twice with 2 mL of 1x PBS. Observe the colonies under the microscope and capture the images at 4X or 10X magnification using any bright field microscope with a camera. Plate human iPSCs in 24-well plate and culture for 4-5 d with daily media change. Wash cells once briefly with PBS and fix for 20 min with 4% paraformaldehyde (PFA) in PBS. Wash three times for 10 min (3x, 10 min) with PBS at RT. Saturate non-specific sites with 10% normal goat or donkey serum (NS, depending on the animal secondary antibody was raised in) in PBS for 40 min at RT. For only intracellular epitopes, include 0.3% TX-100 in PBS (TX/PBS) to permeabilize. Wash 3x5 min with PBS at RT. Dilute the OCT4, NANOG, TUJ1, NKX2-5 and SOX17 antibodies in a fresh solution of 5% NS in PBS and incubate for 2 h at RT or overnight at 4 °C. Wash 3x for 5 min with PBS at RT. Dilute appropriate secondary Alexa Fluor 488 or 568 antibodies in 5% NS/PBS and incubate cells for 1 h at RT. Wash 3x for 5 min at RT. Incubate with DAPI in PBS for 10 min and wash 2x for 5 min at RT. Use a fluorescent microscope to take pictures. Plate human iPSCs in a 6-well plate and culture till the colonies become 80% confluent (at least 105 cells /sample) with daily mTeSR1 medium change. On the day of the experiment, isolate the cells and dissociate to a single cell suspension as explained above in the protocol. Wash with 10% FBS medium. For surface markers, resuspend in 0.5-1 mL of 10% FBS medium and keep on ice. For intracellular markers, resuspend in 1 mL of 4% PFA/PBS and incubate for 10 min at room temperature. Wash with 10% FBS medium. Resuspend in 0.1% TX/PBS and incubate for 15 min on ice. Wash again with 10% FBS medium. Resuspend in 0.5-1 mL of 10% FBS medium and keep on ice. Add 50 µL of the cell suspension to 50 µL of 10% FBS medium containing recommended amount of TRA-1-60, TRA-1-81 or SSEA-4 antibodies and incubate for 30 min to 1 h.
Wash twice with 10% FBS. Resuspend in 100 µL of 10% FBS medium containing fluorescent secondary antibodies and incubate for 30 min. Wash twice with 10% FBS and resuspend in appropriate volume of 10% FBS. The live cells can be differentiated from dead cells by propidium iodide dye added at <1 µg/mL to estimate cell apoptosis during the process. Seed two 6-well plates with 1.5-2 x 106 iPSCs/well in mTeSR1 medium with 10 µM rock inhibitor. Allow the cells to grow for 2-3 d with daily mTeSR1 medium change until the wells are 80-90% confluent. For ectoderm induction, add neural induction medium (NIM) according to the manufacturer's instructions in 2-3 wells of the 6-well plates. Change the medium to RPMI containing 2% B27 supplement minus insulin and 12 µM CHIR99021 for mesoderm induction in 2-3 wells of the plates14. Add only RPMI containing 2% B27 supplement minus insulin for the next 24 h. Add 5 µM IWP4 to the RPMI medium with 2% B27 supplement minus insulin for the next 24 h. After 72 h, replace the media with RPMI containing 2% B27 supplement leading to the generation of beating cardiomyocytes in 2-3 d.
For endoderm induction, change the medium in wells of the 6-well plates to MCDB 131 supplemented with 1.5 g/L sodium bicarbonate, 1x Glutamax, 10 mM glucose, 0.5% BSA, 100 ng/mL GDF8, and 5µM of CHIR99021 for 24 h. Culture in the same medium without CHIR99021 for 2-3 d15. Follow the immunostaining protocol from step 2 for all the three lineages and check for the expression of relevant markers. Aliquot Cas9 protein into microcentrifuge tubes in sterile conditions and store the aliquots by freezing the tubes at -80 °C. Design two targeting guide RNAs per gene based on the software from MIT (http://www.genome-engineering.org/crispr/) or any other CRISPR guide design webtool. Target first or second exon of the gene (based on open reading frame) to generate knockouts. Choose the two guides so that they cut close together (~30-100 bp apart) and we can easily visualize the deletion using the same set of screening primers. Choose the guides from the software output on the basis of higher quality score and lower number of off-target sites. Design screening primers using the program primer blast (https://www.ncbi.nlm.nih.gov/tools/primer-blast/). Screening primers should be at least 100 bp away from the Cas9 cut sites and the PCR product size should preferably be between 400-700 bp for easier amplification by PCR. Design the two complementary sgRNA oligo DNAs (19-22 nucleotides in length depending on the guide sequence) with a Bsa1 cut site at each end. The oligo DNAs can be synthesized commercially and annealed to form double-strand DNA. For annealing, add 1 µL each of 100 µM guides, 25 µL of annealing buffer (10 mM Tris, pH7.5-8.0, 50 mM NaCl, 1 mM EDTA) and 23 µL of water. Incubate in a thermocycler programmed to start at 95 °C for 2 min and then gradually cooling to 25 °C over 45 min. Clone the 2 µL of resulting fragment into a Bsa1 restriction enzyme digested 1 µL of in-house T7 promoter pCR2.1 vector with a Cas9 binding site using T4 DNA ligase as per the manufacturer's protocol. Sequence the cloned DNA fragments and when fidelity is established, in vitro transcribe the clones using a T7 kit to generate single guide RNAs. Purify the sgRNAs with a commercial kit and elute in RNase-free water. Check the RNA concentration. Culture hiPSCs in mTeSR1 medium as described above until the cells are 40-50% confluent. Two hours before nucleofection, replace the medium with 2 mL of prewarmed mTeSR1 medium containing 10 µM rock inhibitor. One hour later, prepare destination wells for nucleofected cells by aspirating membrane, prepared as above, from 12-well plate and replacing with prewarmed 1 mL of mTeSR1 medium with 10 µM rock inhibitor. Keep at 37 °C for incubation. Prepare nucleofection master mix (scale appropriately depending on the samples) for each sample by adding 16.4 µL of P3 primary cell supplement; 3.6 µL of Supplement 1 from the nucleofector kit; 0.5 µg of Cas9 protein and 0.5 µg of each sgRNA in 22 µL per reaction volume. pMAX GFP vector was also nucleofected as per the manufacturer's recommendations in cells to roughly estimate the efficiency of iPSC transfection. Wash each well with 2 mL of RT PBS after aspirating the medium containing rock inhibitor from the iPSC wells. Then aspirate PBS, add 1 mL of cell detachment solution, and incubate the plate at 37 °C for 10 min. Resuspend the cells in 3 mL of mTeSR1 medium and gently pipette up and down to generate a single-cell suspension. Transfer dissociated cells to a 15 mL centrifuge tube containing 5 mL mTeSR1 medium. Count cells with cell counter and calculate total volume required for 0.5 x 106 cells/transfection. Place desired quantity of cells in 15-mL centrifuge tube, centrifuge at 200 x g for 5 min at RT and aspirate supernatant. Resuspend each unit of 0.5 x 106 cells in 22 µL of the transfection master mix prepared in step 4. Quickly transfer cells into the central chamber of one well of a nucleocuvette strip. Place the strip into a nucleofector device and nucleofect cells using program CB150. After nucleofection, quickly add 80 µL of prewarmed mTESR1 medium containing 10 µM rock inhibitor to each well of the nucleofected cells. Gently mix by pipetting up and down. Gently transfer cells from the strip to wells of the membrane pre-coated 12-well plate containing mTeSR1 medium with rock inhibitor prepared in step 3. After 1 d, change to fresh mTeSR1 medium without rock inhibitor. Harvest cells 2-3 d after nucleofection for single-cell sorting. One day before the sorting, prepare 96-well MEF plates by seeding 2 x 106 cells/gelatin-coated plate in 10% FBS medium. Approximately 70-80% of the clones survive after nucleofection and 2-3 MEF plates can be prepared for each editing experiment. 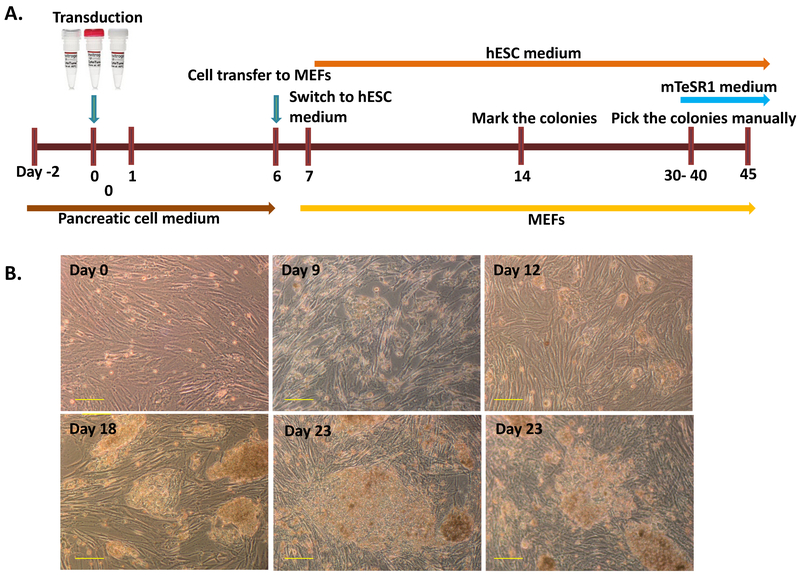 Following the overnight incubation, change the medium to hESC medium (as described previously) supplemented with 100 ng/mL bFGF, 1x SMC4 (inhibitors added to the media to enhance single cell viability), and 5 mg/mL fibronectin to promote adhesion. Replace the medium on the hiPSCs in the 12-well plate from mTeSR1 to mTeSR1 medium supplemented with 1x SMC4 for at least 2 h before single cell sorting. Aspirate the medium from hiPSCs and wash the cells gently with PBS. Add 500 µL of cell detachment solution in each well and incubate at 37 °C for 10 min after aspirating the PBS. Generate the single-cell suspension by adding 1 mL of mTeSR1 (unsupplemented) to each well and pipetting up and down gently several times. Place cell suspension in a 15-mL conical tube and centrifuge for 5 min at 200 x g at RT. Aspirate supernatant and resuspend the cells in 1 mL of mTeSR1. Sort the cells in single cells using a cell sorter with 100 mm nozzle under sterile conditions with one cell in the individual well of the 96-well plates prepared in step 1. Four days after sorting, colony formation should be apparent; at this point replace the culture medium with hESC medium supplemented with 1x SMC4. Eight days after sorting, replace medium with hESC medium and culture for 2 d.
Detach the colonies using 1 mg/mL collagenase for 20 min and transfer them to 24-well membrane coated plates in mTeSR1 with rock inhibitor. Let the single-cell clones grow and extract their genomic DNA after duplicating or expanding them. Use gene specific primers to amplify the target DNA by PCR. Use fragment analyzer kit for initial screening of PCR amplified target genomic region of all clones by running them through the gel/dye mix as per the manufacturer's instructions. Estimate the resulting fragment size in the software PROSize by comparing it with the appropriate ladder, which is run with the samples. Sequence the expected 'edited' clones and analyze sequencing data to confirm the editing or deletions. For differentiating monoallelic and biallelic clones, amplify the edited sequence with PCR and clone in pJET1.2 vector. Send at least 8-10 clones for sequencing and check the sequence to confirm editing in one or both alleles. Once successfully targeted iPSC clones have been identified through genotyping, examine to confirm that they have not lost pluripotency or gained chromosomal abnormalities through the process. In this publication, we have followed a simple but efficient protocol for the generation of iPSC from human pancreatic cells using integration or footprint-free Sendai virus vectors. Figure 1A shows a schematic representation of this reprogramming protocol. The human pancreatic cells were purchased commercially, cultured in Prigrow III medium and transduced with Sendai virus as explained above. Transduced spindle shaped pancreatic cells did not show any morphological changes for ~5 days after Sendai virus transduction on day 0, but then become rounded with bigger nucleus and nucleoli. Some early colonies were seen after a week post-transduction but they were not picked, as in our experience, these colonies quickly dissociate and are usually the 'early partially reprogrammed cells' that do not establish robust colonies. Approximately 10-15 days post-transduction, small bright colonies were observed and were picked after growth (Figure 1B, top right). Human iPSC colonies are compact, tightly packed with clear edges (considered as 'fully reprogrammed cells') (Figure 1B, day 23 bottom middle) and 'partially reprogrammed cells' are loose with gaps in the colony (Figure 1B, day 23 bottom right). The reprogrammed pancreatic cell colonies were growing on day 18 (Figure 1B, bottom left) and were big enough to be picked manually by day 23 (Figure 1B, bottom middle). The colonies were plated on membrane-coated plates after picking to get feeder-free iPSC by day 30-40 (Figure 2A, left). Some of these 'robust' feeder-free colonies were expanded and characterized for the expression of alkaline phosphatase, pluripotency and surface markers in feeder-free conditions. All the clones tested were positive for alkaline phosphatase as they turned bright red after the assay (Figure 2A, right). The pluripotency markers OCT4, NANOG, SSEA4, TRA-1-60 and TRA-1-81 were also observed to be highly expressed in all the clones by immunostaining or FACS analysis (Figure 2B and Figure 3A). These results demonstrate that the human iPSC colonies generated from pancreatic cells expressed pluripotency markers in feeder-free conditions. The pluripotency was also assessed by directed differentiation of human iPSC to three germ layers: ectoderm, mesoderm and endoderm. Clones on membrane potently differentiated to TUJ1-positive neurons (ectoderm), NKX2-5-positive beating cardiomyocytes (mesoderm) and SOX17-positive endodermal cells (Figure 3B). After thorough characterization, 3-robust, feeder-free iPSC clonal lines were chosen for the genome editing studies. The two guides with BsaI cut sites at ends were designed for each gene to cut close together (i.e., n less than ~100 bp). The schematic of the protocol is shown in Figure 4. This deletion strategy used for the target genes allowed us to easily delete a portion of the first or second exon of a gene. This strategy was very efficient and we could isolate edited clones in every attempt. The guides were cloned into BsaI digested vector and in vitro transcribed as described above. We nucleofected guides (RNAs) and Cas9 protein as RNP complexes for quick and effective editing. We also sorted the cells as single cells on MEFs as recovery of cells is higher as compared to the cells sorted singly on membrane-coated plates. Genomic DNA was isolated from all clones, the target portion was amplified by PCR and resolved on fragment analyzer to screen for changes in sizes of target fragments as compared to the controls. The fragment size was compared to the ladder run with the samples to detect 'edited' clones (Figure 4, bottom). This made screening of clones easy as we could go through >90 clones in one plate and the results were obtained with the accuracy of ± 3 bp. The selected clones were then sequenced to confirm wild-type and mutated clones. Wildtype clones had no deletion or addition of bases while mutated clones had either addition or deletion in the sequence as compared to the wildtype. The clones showing deletion or addition in sequencing were expanded and cloned into pJET1.2 vector to identify monoallelic and biallelic clones by sequencing of at least 8-10 colonies per cloning. Monoallelic clones had bases deleted or added in one allele and the other was unaltered and similar to the wildtype allele. Biallelic clones had deletions in both the alleles. Roughly three hundred clones were screened for all target genes, which identified approximately 9 monoallelic deletion clones and 3 biallelic deletion clones in each case. This roughly corresponds to a 3-fold reduction in frequency of generation of biallelic clones compared to monoallelic clones. Heterogeneity within the deletion amplicons reflected imperfect and inconsistent NHEJ repair. The expression of the gene was finally confirmed by extracting RNA from target cells and by performing RT-PCR. Figure 1: Reprogramming of human pancreatic cells to feeder-free pluripotent cells (iPSC). (A) A schematic protocol for the generation of iPSC from human pancreatic cells is shown. The pancreatic cells were grown on collagen-coated plates and then transferred to MEFs after transduction with human Sendai virus vectors. The completely-reprogrammed colonies were then transferred to hESC qualified membrane and characterized. (B) Morphological changes after Sendai virus transduction. Before the transduction, pancreatic cells show typical spindle-like morphology (top left, day 0). Small, tight colonies appear on MEFs by day 12, resembling human pluripotent cell colonies. Normally the fully reprogrammed human iPSC colonies have very clear boundaries and can be picked up by day 23-30. A dissociated colony at day 23 is shown on bottom right. All the images were captured at 100X magnification (10X objective and 10X eyepiece). Scale bar = 100 µm. Please click here to view a larger version of this figure. Figure 2: Characterization of human iPSC. (A) A typical phase contrast image of an iPSC colony after picking and culture in feeder-free conditions (40X, 4X objective and 10X eyepiece; left) after Sendai virus reprogramming of pancreatic cells. Alkaline phosphatase stained red iPSC colony is on the right. For the alkaline phosphatase staining, the iPSC colonies were fixed and stained red after the addition of substrate solution from the kit. The images were captured at 40X. 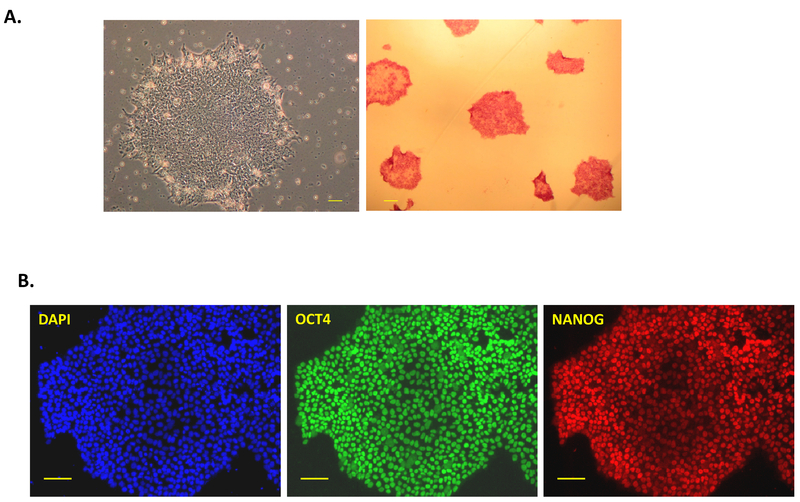 (B) Immunostaining for pluripotency markers NANOG, and OCT3/4 in feeder-free human pancreatic cell-derived iPSCs. DAPI was used to stain nucleus blue as a control. All the images were taken at 100X magnification. Scale bar = 100 µm in all images. Please click here to view a larger version of this figure. Figure 3: Characterization of pluripotency and differentiation potential of iPSC. 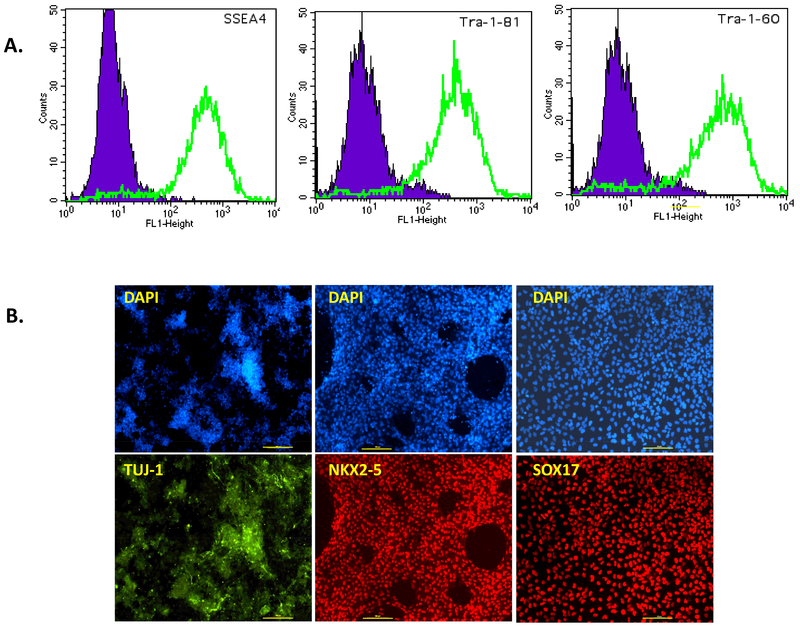 (A) FACS analysis of surface markers SSEA4, TRA-1-60 and TRA-1-81 in feeder-free iPSCs. The cells were dissociated to single cell suspension and stained for surface markers SSEA-4, TRA-1-60 and TRA-1-81. The purple peak contains iPSC negative (antibody control) cells and pancreatic iPSC can be visualised as the green peak. (B) Immunofluorescent imaging of germ layer marker genes. The expression of markers TUJ1 ectoderm (green), NKX2-5 mesoderm (red) and SOX17 endoderm (red) in cells after directed differentiation of pancreatic iPSC. Corresponding control nuclear stain DAPI is blue. All the images were taken at 100X magnification. Scale bars = 100 µm. Please click here to view a larger version of this figure. Figure 4: Schematic of CRISPR/Cas9 deletion strategy. One sgRNA pair was designed (marked red) with BsaI cut sites at the end (shown as F and R) preferably targeting the first exon, annealed, cloned in BsaI digested modified vector (pCR2.1, BsaI site highlighted grey), sequenced and in vitro translated. The underlined sequence of vector shows the part deleted after BsaI digestion. The position of screening primers is indicated in blue. Cas9 and guide RNAs were nucleofected in feeder-free iPSC as a complex for genomic deletions. iPSCs were then single cell sorted on 96-well MEF plates, cultured, transferred to membrane, expanded and screened by fragment analyzer. For running the samples on the analyzer, genomic DNAs of Cas9 and guide transfected clones on membrane were extracted and passed through the gel/dye mix in the analyzer to select for potential 'edited' clones (bottom middle).The relevant ladder markers, WT and potential edited clones are marked.The expression of the gene was confirmed by extracting RNA and analyzing with Q-PCR. Please click here to view a larger version of this figure. Reprogramming of human somatic cells to iPSCs has provided a major boost to the fields of basic biology research, personalized medicine, disease modeling, drug development and regenerative medicine16. Many current and widely used methods of human iPSC generation require the use of virus with the risk of integration into the host genome or episomal vectors with low reprogramming efficiency. Here, we present an efficient method for generating feeder-free iPSCs from human pancreatic cells with Sendai-virus, which leads to 'footprint free' and efficient reprogramming. The resulting human iPSCs are free of viral transgenes, maintain pluripotency, and avoid the use of unknown exogenous factors. The generation of iPSCs in feeder-free conditions has low reprogramming efficiency, so we reprogrammed the primary pancreatic cells on feeder cells and then moved the colonies to feeder-free membrane for expansion, culture and characterization. The fusion of these techniques provides stable, reliable and more efficient iPSC programming. We also generated iPSCs from human fibroblasts and other primary cells with this method, which suggests that Sendai-virus can be used to reprogram wide variety of cells. Important considerations are: a need for optimal confluency of primary cells to be reprogrammed as too few or too many cells impacts reprogramming efficiency; an earlier passage of primary cells when the cells are still optimally dividing; careful titration of the viral vectors that results in minimal cell apoptosis and a high efficiency leading to easy pick up of robust colonies; verifying the loss of Sendai vector transgene expression by PCR at 10-15 passages to ensure that the iPSCs are 'footprint free'; and, strict sterile conditions for culture of iPSC on membrane. We used a convenient and efficient method of CRISPR genome modification to edit the iPSC genome. This technique combines Cas9 protein and sgRNA, RNP complexes to recognize and cleave the complementary DNA sequences. It can be easily adapted to target a genomic sequence by simply changing the 20 bp guide RNA. 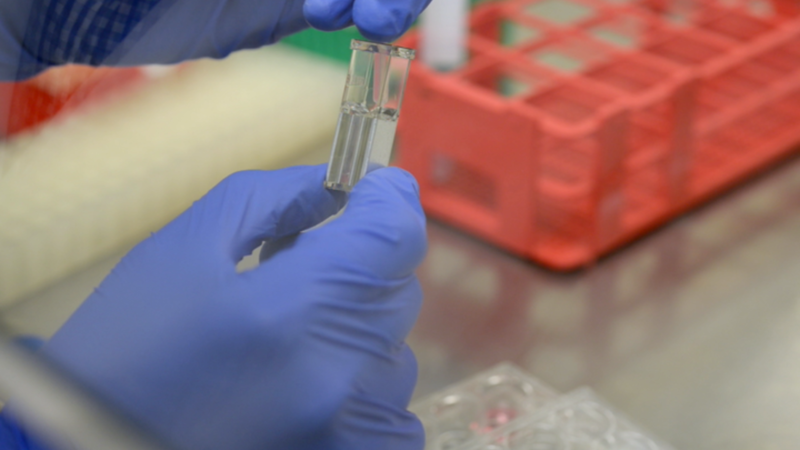 Our method provides an easy protocol for efficient and reproducible editing of human iPSCs as they are more labor-intensive, difficult to transduce, and expensive to maintain than other cells. We design at least two adjacent but non-overlapping guides for each target gene so that a single set of screening primers can be used for screening the edited clones. In addition, use of two guides ~30-100 bp apart generates a large deletion, which can be easily visualized during preliminary screening and ensures depletion of protein. The guides can be tested in HEK-293 cells initially to estimate efficiencies before starting the assay in iPSC. Additionally, it is critical to establish parameters for routine transfection of reagents into iPSC. Using pMAXGFP plasmid, transfection efficiencies of >80% and gene targeting/disruption efficiencies of 3-10% in iPSCs are routinely achieved. The direct delivery of Cas9 RNP complexes into cells in our protocol provides rapid action and fast turnover and maintains high rates of targeted modification. Our approach employs single cell sorting following nucleofection of guides and Cas9 protein, overcoming a significant obstacle of gene targeting in mixed iPSC population and ensuring the clonality of the cells. This 'novel' overall approach is straightforward, easy to multiplex, takes only a few weeks and does not require any antibiotic selection. We did not observe any loss in efficiency by sequentially introducing deletions by CRISPRs into a cell line or iPSCs, although karyotype analysis needs to be performed in such cases to ensure genomic stability. The clones should also be checked for the expression of pluripotency markers. Although, not a focus of this publication, this protocol can be co-opted to induce precise genetic modification by including the repair template in the transfection cocktail17,18. Finally, based on our experience, important considerations for iPSC editing protocol are: rational design of guides to minimize or altogether avoid off target mutations especially in the "seed region" or close to PAM motif being modified; optimizing nucleofection efficiency in the iPSCs to ensure delivery of RNPs; verifying the quality of prepared guides;titration of guide and Cas9 protein concentrations and validating their activity by in vitro biochemical cleavage assays or as described in this article in human cellssuch as HEK cells that are easier to culture and transfect; use of early passage iPSCs that are in log phase of growth and reaching ~50% confluency; careful handling of cells with gentle medium changes following single cell sorting to ensure survival of cells. We believe that the above outlined protocol delineated in adequate detail will equip the readers with a roadmap to generating and editing iPSC in a reproducible fashion. BT is a founding member of RenOVAte Biosciences Inc.
Work in the lab was supported by postdoctoral fellowship grant to Dr. Anjali Nandal, and Exploratory grant from Maryland Stem Cell Research Fund to BT (TEDCO). Malik, N., Rao, M. S. A review of the methods for human iPSC derivation. Methods Mol. Biol. 997, 23-33 (2013). Yu, J., et al. Induced pluripotent stem cell lines derived from human somatic cells. Science. 318, 1917-1920 (2007). Sommer, C. A., et al. Induced pluripotent stem cell generation using a single lentiviral stem cell cassette. Stem cells. 27, 543-549 (2009). Fusaki, N., Ban, H., Nishiyama, A., Saeki, K., Hasegawa, M. Efficient induction of transgene-free human pluripotent stem cells using a vector based on Sendai virus, an RNA virus that does not integrate into the host genome. Proc. Jpn. Acad. Ser. B, PhysBiol. Sci. 85, 348-362 (2009). Nakagawa, M., et al. A novel efficient feeder-free culture system for the derivation of human induced pluripotent stem cells. Sci. Rep. 4, 3594 (2014). Hockemeyer, D., Jaenisch, R. Induced Pluripotent Stem Cells Meet Genome Editing. Cell stem cell. 18, 573-586 (2016). Komor, A. C., Badran, A. H., Liu, D. R. CRISPR-Based Technologies for the Manipulation of Eukaryotic Genomes. Cell. 169, 559 (2017). Komor, A. C., Badran, A. H., Liu, D. R. CRISPR-Based Technologies for the Manipulation of Eukaryotic Genomes. Cell. 168, 20-36 (2017). Sander, J. D., Joung, J. K. CRISPR-Cas systems for editing, regulating and targeting genomes. Nat. Biotech. 32, 347-355 (2014). McElroy, S. L., Reijo Pera, R. A. Preparation of mouse embryonic fibroblast feeder cells for human embryonic stem cell culture. CSH Protoc. 2008, (2008). Lian, X., et al. Robust cardiomyocyte differentiation from human pluripotent stem cells via temporal modulation of canonical Wnt signaling. Proc. Natl. Acad. Sci. U.S.A. 109, E1848-E1857 (2012). Rezania, A., et al. Reversal of diabetes with insulin-producing cells derived in vitro from human pluripotent stem cells. Nat. Biotech. 32, 1121-1133 (2014). Shi, Y., Inoue, H., Wu, J. C., Yamanaka, S. Induced pluripotent stem cell technology: a decade of progress. Nat. Rev. Drug Discov. 16, 115-130 (2017). Wang, B., et al. Highly efficient CRISPR/HDR-mediated knock-in for mouse embryonic stem cells and zygotes. BioTechniques. 59, (2015). 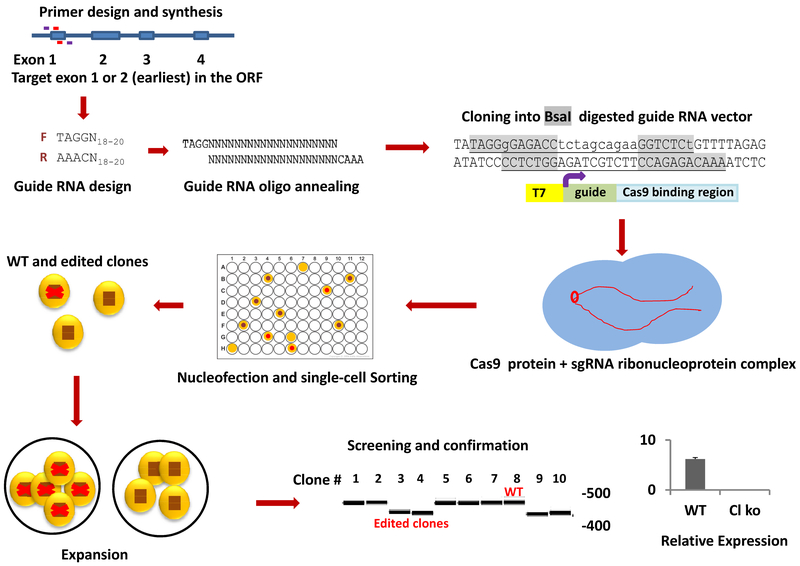 Liang, X., Potter, J., Kumar, S., Ravinder, N., Chesnut, J. D. Enhanced CRISPR/Cas9-mediated precise genome editing by improved design and delivery of gRNA, Cas9 nuclease, and donor DNA. J Biotech. 241, 136-146 (2017).